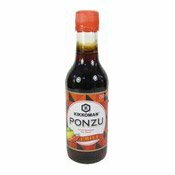 This Ponzu - a blend of soy sauce, vinegar, lemon and chilli flavourings will spice up your everyday dishes. Keep in the refrigerator after opening and consume within 3 months. Ingredients: Water, Soy Sauce (Water, Soybeans, Wheat, Salt) (31%), Sugar, Spirit Vinegar (!4%), Concentrated Lemon Juice (3.1%), Salt, Natural Lemon Flavouring, Capsicum Extract, Yeast Extract.